In the past, the year in review has tried to summarize the small world of Sylvia Plath as I live it. I suspect this post will be no different. Rather than go through the blog month by month, I trust that the blog archive in the sidebar will be a sufficient way for many of you to access the posts that appeared in the calendar year 2015. By and large this year was dominated for me in two respects. The first is the Letters of Sylvia Plath project, a book which I am co-editing with Karen V. Kukil of Smith College for Frieda Hughes to be published by Faber. From the beginning of the project which officially was underway in 2013 -- but which I have been working on since circa 2010 -- it has been a privilege to read, transcribe, annotate, index, etc. all of the known letters by Sylvia Plath. I am not at liberty to say too, too much about the letters or the project now but suffice it to say someday I will. Each and every one of the thousands of hours I have spent on this project has been with you, this readers of this blog as well as those who read Plath in general, in mind. I hope that you take as much enjoyment in reading the book as I have had in helping to prepare it for publication (at a to be determined future date). 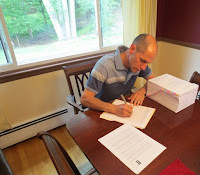 Here is a photograph of me signing the contract for this book next to the second draft! There were not too many books to come out this year. Elizabeth Sigmund and Gail Crowther's Sylvia Plath in Devon: A Year's Turning came out late in 2014. 2015 saw the publication of Julia Gordon-Bramer's Fixed Stars Govern a Life: Decoding Sylvia Plath (Stephen F. Austin University Press) was published in January 2015. I have dipped into and out of Julia's book this year as I can but am ashamed to say I have not yet finished reading it. I have found it difficult to read about Sylvia Plath while I have been so intensely reading Sylvia Plath. In addition, there were two other academic press books to come out: Sylvia Plath and the Language of Affective States: Written Discourse and the Experience of Depression by Zsofia Demjen (Bloomsbury Academic) and Mirrors of Entrapment and Emancipation: Forugh Farrokhzad and Sylvia Plath by Leila Rahimi Bahmany (Leiden University Press). Also published this year was the long awaited biography Ted Hughes: The Unauthorised Life by Jonathan Bate (William Collins, UK & Harper Collins, US). In late September and early October, it seemed the world was dominated by reviews, contention, and drama and somehow we have come out on the other side of all that. I was privileged to read and comment on the manuscript in the spring and am thrilled some of my corrections and/or suggestions were taken! Bate makes excellent use of archival resources, and his notes and citations for Hughes' letters, journals and poetry drafts is commendable. It will be immeasurably helpful for Hughes scholars and future Hughes biographers. The second dominant aspect of this year for me in terms of Sylvia Plath was befriending her first best and lifelong friend Ruth (Freeman) Geissler. After reading Andrew Wilson's Mad Girl's Love Song back in 2013, I slowly and systematically tried to reach out to many of the people that Plath knew in the attempt to locate letters. 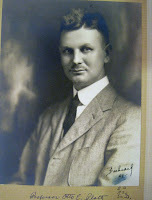 I did not reach out to too many people who had already donated or sold letters to various archives as presumably they gave or sold everything they had. In late 2014, I wrote to 'Ruthie'. I did not hear anything for a few weeks but shortly into January and email popped up in my inbox from her and it was one of those heart-skips-a-beat moments. Initially we discussed Plath at length: from the letters that Ruth held, to photographs, handmade cards, clothing, etc. We discussed life in Winthrop and Wellesley in the 1940s as well as college life in the early 1950s and married life in the later 1950s. Our friendship developed through discussing Plath's stories and poems; particularly those stories that Ruth herself lived through and witnessed. When I work on any letter or ready a diary entry by Plath that mentions Ruth, a little spark of excitement goes through me. All the emails lead to a strong friendship, so strong in fact that we have inside jokes about things like meat (yuck), dandelions (bane of my existence), and dictums of balancing out my obsessive Plathian tendencies by taking my wife out for nice dates. This was all fine and dandy until the recent weekend of 14 November when Karen Kukil and I drove out to meet Ruth. To quote Plath: "What a thrill"! We discussed Plath among other topics and had a wonderful five hours together over dinner one night and coffee and treats the next morning. A whirlwind weekend I hope repeat, repeat, repeat. This year I spent a decent chunk of time also tracing down some press releases that Plath more than likely authored based on evidence in her letters, diaries and calendars, and other sources. This will be the subject of a forthcoming blog post in 2016. I did not find everything that Plath took notes on, which was frustrating, but it likely just meant that the article was not published due to space constraints in the respective newspapers. I was able to find a couple of other things along the ways, such as a previously unacknowledged letter to the editor published in the March 1955 issue of Mademoiselle. In March of this year, I was able to spend four days at the Lilly Library, sleep deprived, doing research for the letters book. I accomplished a lot and still make use, nearly daily, of the information I obtained whilst there. Deepest gratitude to the staff there for being so accommodating. Over on my website for Sylvia Plath, A celebration, this is, things were updated periodically (text, book covers and photographs) and mostly unacknowledged. I did add a new page to the Bibliography section: Articles of Sylvia Plath's First Suicide Attempt. This builds upon the previous bibliography of articles I published in my paper "'They Had to Call and Call': The Search for Sylvia Plath" (2010). This year has had far fewer blog posts than in years past. Sorry! But I hope the content that did appear continues to be relevant and interesting. This was because of the letters project and I hope that in 2016 I have more time to do more original blogging, reviews, and keeping more up-to-date on news stories on Plath as and when the come up (if they are interesting, most are not!). A lot of people did guest blog posts or gave me ideas for other posts this year which relieved a lot of stress and kept the blog going to regular updates. Thanks must therefore go out to Annette Stevens, Amanda Ferrara, Sheila Hamilton, Katie Mikulka, Peter Fydler, Tony Cockayne, and Gail Crowther. Things to look forward to in 2016 and beyond. Heather Clark is still very hard at work on her new literary biography of Sylvia Plath, to be published by Knopf (see Plath Unbound here). There is a book for which I am particularly thrilled to give some advance promotion! Gail Crowther recently submitted her manuscripts titled The Haunted Reader and Sylvia Plath to Fonthill Media, publishers of her Sylvia Plath in Devon: A Year's Turning. Look for The Haunted Reader and Sylvia Plath in mid-to-late 2016. Thank you all for reading, following, commenting, encouraging, visiting, and supporting this blog. Your interest and enthusiasm fuels me beyond expression. Be safe and warm. Happy holidays and New Year. See you in 2016! All links accessed 22 October, 10 November 2015, and 20 December 2015. Recently, though, I had a change of heart about the bulk of this post. Much of what I wanted to say I learned years ago but will refrain from posting now as I believe that Heather Clark, in her forthcoming biography of Sylvia Plath, will discuss at beautiful and thorough length the history and biography of Otto Plath. However, what I do still want to relate is interesting information I obtained Warren's Plath's daughter Susan in June 2014 concerning something Paul Alexander wrote as fact in his biography of Sylvia Plath, Rough Magic. Alexander writes, "On April 13, 1885, in the village of Grabow, Germany, he a born Otto Emil Platt" (Da Capo Press edition, 2003: 15). This is patently not true. Susan told me that when she asked Alexander about this several years ago he admitted that he simply made it up. (And makes me wonder what else he made up in his book! Rough Magic, indeed ) So, if you ever happen to read anywhere that Otto Plath was born Platt, please keep in mind this valuable information provided by the PLATH family. 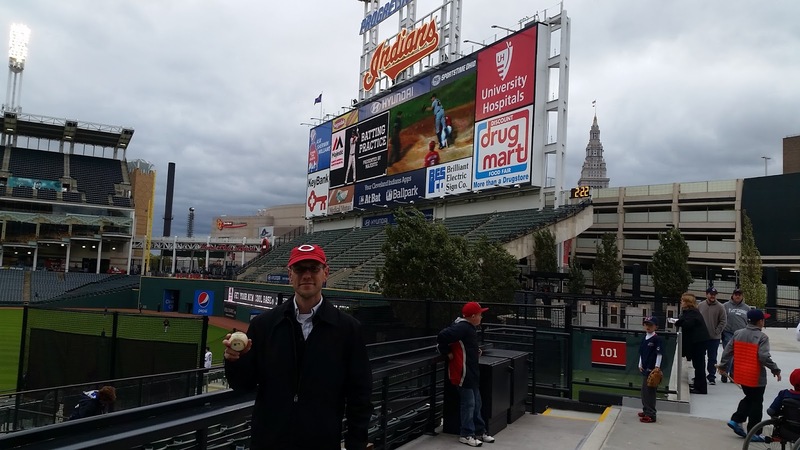 In late September and early October I took a vacation, the purpose of which was to enjoy the last hold of summer and enjoy the American pastime: baseball. I found myself in Cleveland, Ohio, a city in which there is almost nothing to do (it took me 6 hours of walking around just to find a postcard). So, before attending the Minnesota Twins versus the Cleveland Indians baseball game that night, a game won by the Twins and in which I caught a home run ball hit during Twins batting practice, I visited the Cleveland Public Library to, of course, look through microfilm of their 1953 newspapers. As you do, right? The Cleveland Plain-Dealer was available through a database but I did not find an article there. Two other papers, the Cleveland News and the Cleveland Press were available on microfilm only so I spent an hour or so looking through the papers this way. Happily! 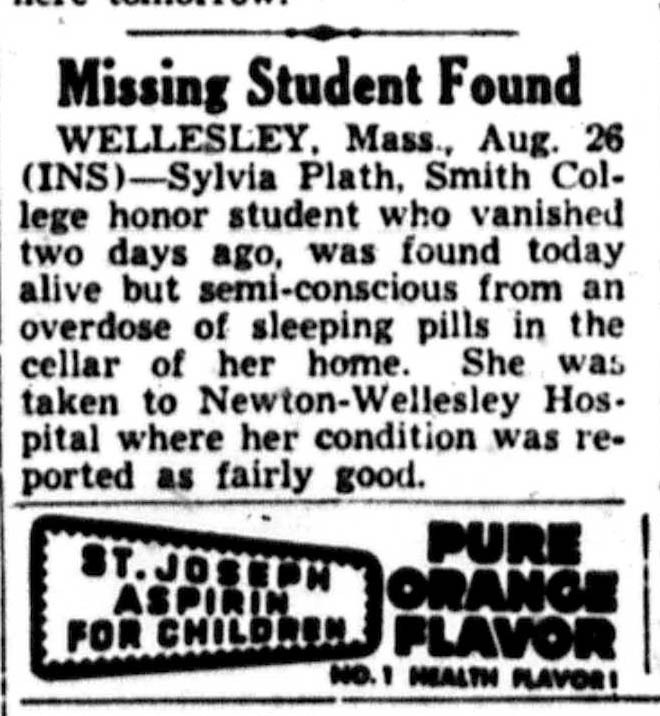 I found one article in each paper, which adds to the list of articles on Plath's first suicide attempt/disappearance. "Smith College Student Missing." Cleveland News. August 26, 1953: 1. "Hunt Top Student." Cleveland Press. August 26, 1953: 12. These two articles bring the total up to 198 articles found. Before Cleveland, in Cincinnati which is a city with even less to do (especially during the rain delay of the Chicago Cubs versus the Cincinnati Reds baseball game), it did not occur to me to look through their microfilm in their public library (which has a beautiful book sculpture on Vine Street). We were so bored one day by 8 a.m. that I asked my wife if we could pop over to the Lilly Library for the day but she said no. I requested the Cincinnati newspaper via Interlibrary Loan so perhaps the city might have covered it and will redeem itself, somehow. That's disingenuous and maybe unfair as the food was fine at Taste of Belgium and Melt Eclectic. The other city we hit, Pittsburgh, was amazing on all fronts: feel/vibe, food, ballpark and quality of baseball. Later . . . not like you can tell . . . 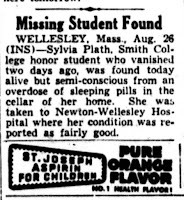 But after a couple of weeks the Boston Public Library received the Cincinnati Enquirer for me on microfilm via Interlibrary loan and the Queen City only marginally redeemed itself by yielding an addition article on Plath's first suicide attempt, bringing our total to 199. "Missing Student Found." Cincinnati Enquirer. August 27, 1953: 11. See the complete, in progress, bibliography here. All links accessed 6 October 2015.